I grew up in the 80s and one of the things that brought me and my friends the most pleasure was playing video games. I started with the Atari then upgraded the NES, followed by my favourite classic console, the Super Nintendo (SNES). 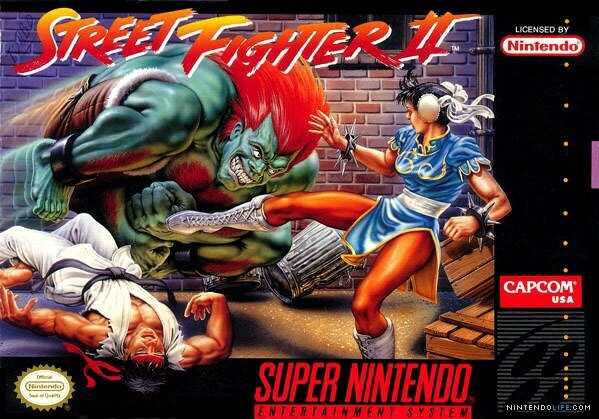 And one of the games we played the most was Street Fighter 2. A game of ultimate combat between a menagerie of colourful characters each with their unique fighting styles and powers. 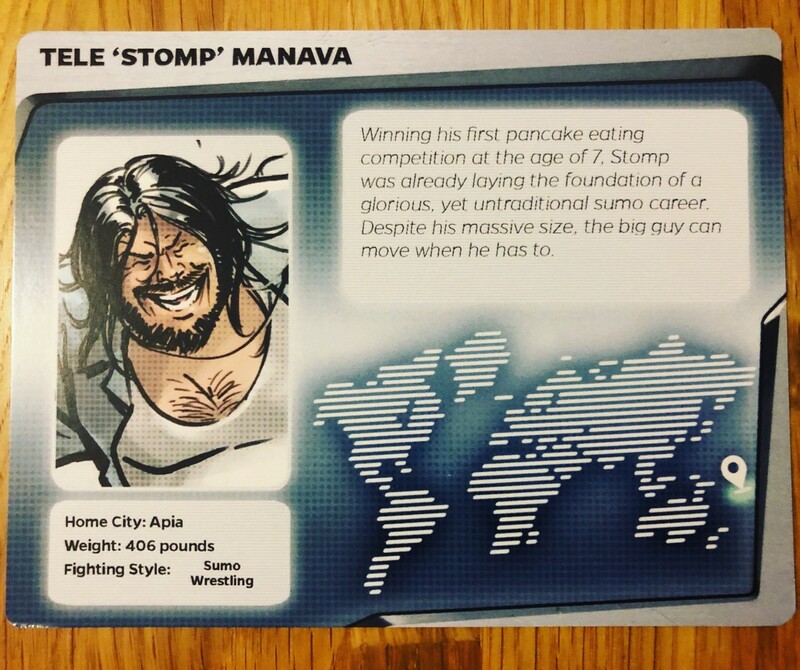 Each of us had a couple of favourite characters to play, balancing their fighting styles and desperately mashing buttons to pull off a devastating combo. 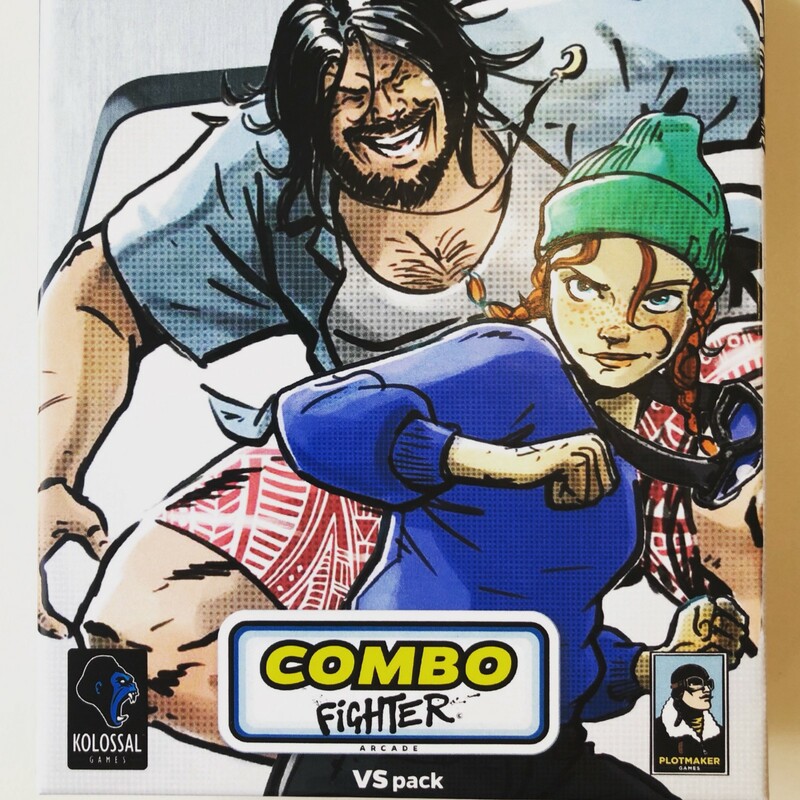 It was a lot of fun, and a big reason I was instantly drawn to the card game – Combo Fighter. Combo Fighter is clearly heavily inspired by games like Street Fighter (perhaps even in the name!). 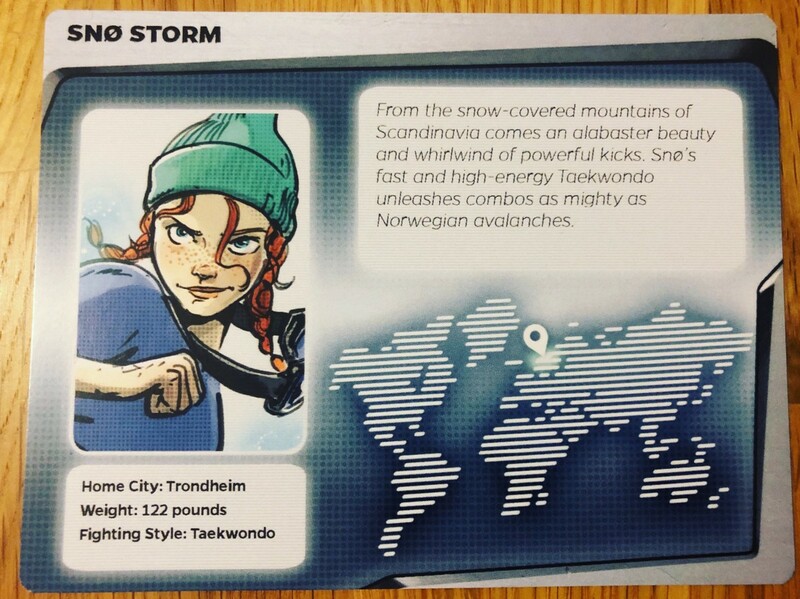 The game offers a range of 8 characters to play – although the free review copy I received only came with 2 – Snø Storm from Norway and Tele Manava from Samoa (those familiar with Street Fighter might spot a resemblance to E. Honda and Chun Lee from). Like the classic arcade games of yore, each character has a particular fighting style and even their own special combos. I played the game with 2 players although it can support 3 and 4 players. 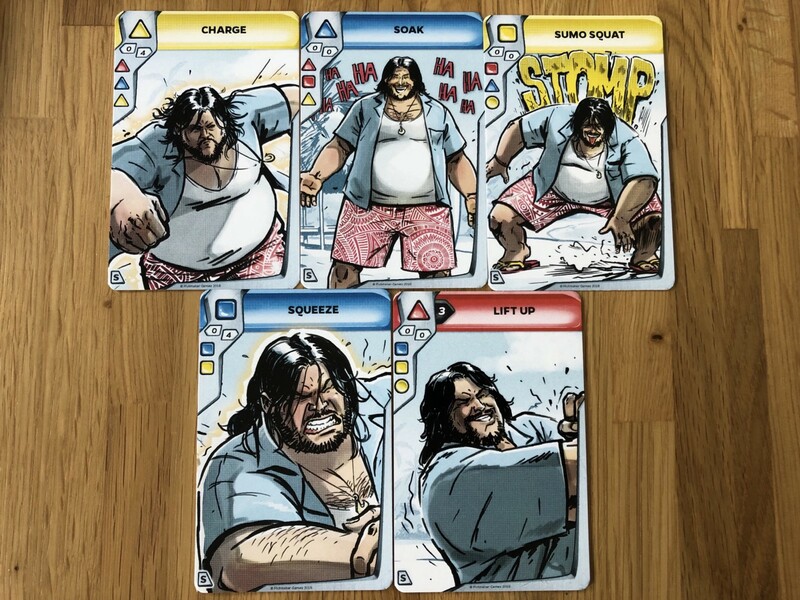 To set up the game each player has a starting hand of 5 cards and a draw deck of combat cards that act as their ‘Health bar’. A stagger card goes at the bottom of each draw deck. Players each pick a card from their hand and play it simultaneously and combat ensues. Defence cards beat Attack cards, Attack cards beat Footwork cards and Footwork cards beat Defence cards. If you both draw blue (defence) or yellow (footwork) cards, there is a tie except if one card has a priority asterisk (*) symbol. 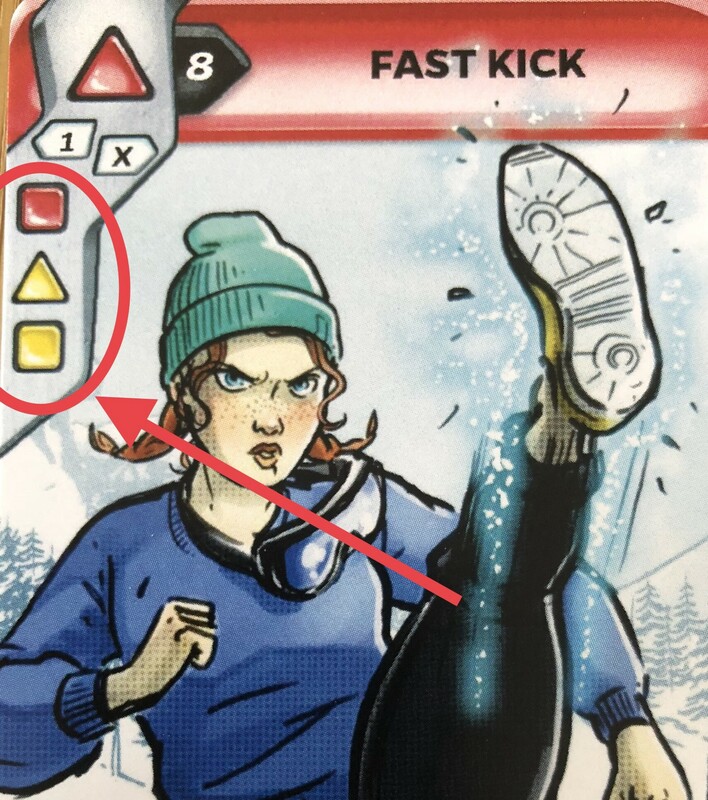 If you both draw red (attack) cards the card with the higher initiative wins (the white number on the black background – see the middle red card below). As you’d expect, each character has a different number of these types of cards in their decks. Allowing for a delightful asymmetry of play and challenging you to master the play styles of your chosen character. This asymmetric system is a key element to the game, allowing for some interesting mind games and bluffing with your opponent. If you win the simultaneous card draw, you have the option to launch a devastating combo attack. Each card you play shows an number of symbols on the left hand side. This indicates which subsequent cards you can chain in a combo. This is where you really get to dish out the damage and deplete your opponent’s Health Bar (draw deck). Each player has signature combos that deal even more damage. These have to be precisely executed and some even have an enhanced ‘moxie’ version that deals more damage. Your opponent discards cards from their draw deck equal to the damage you’ve dealt them. After a round ends players discard any played cards and then draw back up to a hand of 5. The game continues till one player is knocked out. Alternatively your character could get ‘staggered’ if all but their last card is left. In this case they shuffle their discard pile and form a new draw deck – but one more hit will defeat them. 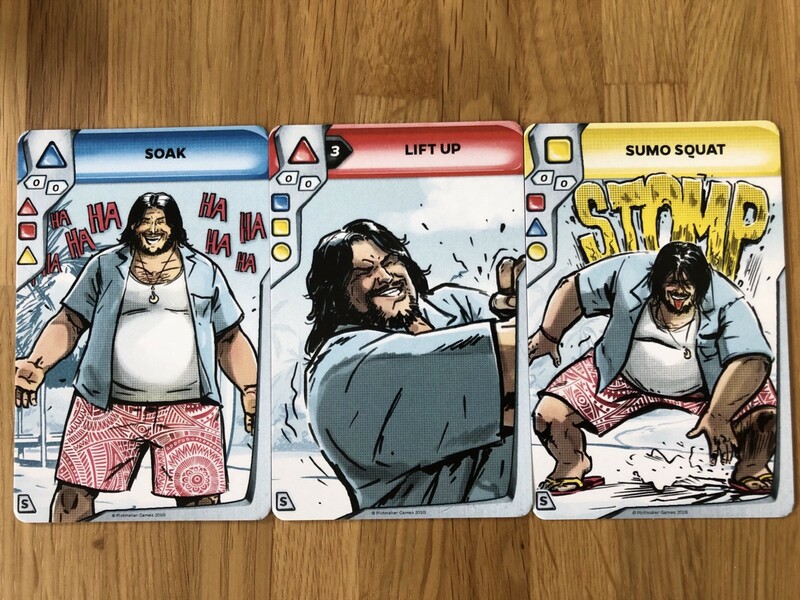 Finally each player has a special power card that can modify how they play or offer other advantages – further cranking up the asymmetry. I haven’t had a chance to play this game many times and I only have 2 characters to pick from. But my first impression is very positive. In addition to the nostalgia factor, the artwork in this game is fantastic. As for the game play it’s quick and simple, with a small enough footprint (important for a minimalist with a tiny collection) that makes it’s great for a pub / cafe game. The addition of the asymmetry and bluffing adds enough crunch to make it even more enjoyable. As a comparison I own and enjoy Dice Thrones – another big combat game that came out over the last year. I actually feel that I might like Combo Fighter better. It’s more compact and the lack of dice makes me feel like I have a bit more agency. 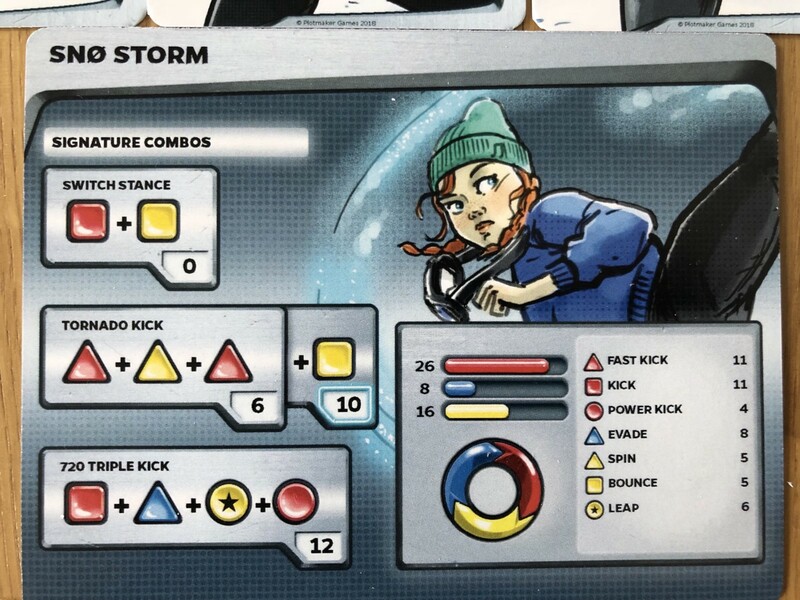 I have to give credit to the designers for really capturing that Street Fighter video gaming experience in a deck of cards. If I have any negatives it would be the the current version of the rule book could have been a bit clearer on some points (although the game is simple). But this isn’t a final production copy. Also I don’t know what the longevity of this game would be with just 2 characters – you’d probably want to full set to have the variety although that means more shelf space. All in all a solid game I’d be happy to add to my very limited collection of board games! A board game newbie — sharing views on my minimalist board game collection & my struggle to keep it that way!